Note: there is a more recent (slightly shorter) version of this walk, with many more, larger photographs. 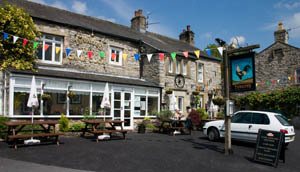 Start: Austwick(SD767684) - no car park in village, but plenty of on road parking. 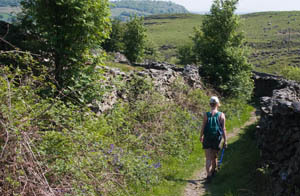 The walk is (mainly) along clear tracks and paths walking up Crummack Dale and then along areas of limestone pavement, before descending back along the other side of the valley. Follow the road north east through the village past the pub and the school. Turn left to walk up Townhead Lane. Look out for public footpath sign by what appears to be a driveway on the right. Walk through a gate (into what looks like a cottage garden - there is a sign on the gate asking that dogs are kept on a lead). Pass through another wooden gate and walk across a driveway and over stile set in a stone wall. Walk through a field, keeping stone wall on your right. Climb a gated stone stile, cross a track and enter next field by climbing a similar stile. At the end of the field climb ladder stile, walk down to cross a stream via small bridge, then climb up hillside to climb a ladder stile. Turn right to re-join lane. Notice the Norber erratics on the hillside to the left. The surface of the lane changes from tarmac to a rougher surface by a sign saying, "Thieves Moss 2 1/3 miles". Walk past the wooded area surrounding buildings at Crummack on left and pass through a wooden gate. Walk through a second gateway into a field, keeping stone wall on right. Climb over a stone stile set in wall next to a wooden gate. The path then moves away from the wall. There are well spaced wooden poles and cairns to mark the route towards Beggar's Stile. 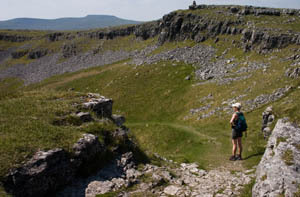 Walk up the gap in the scar to cross Beggar's Stile (the photograph is taken from above the stile.looking back down Crummack Dale). The path winds through an area of limestone pavement, with the odd small cairn dotted along it to lead up another scar to a wooden gate in a stone wall. Go through the gate, then turn right to go, almost immedaitely, through a wide gate or over a ladder stile. Continue along this path until you reach a junction of paths. Turn right, along path signposted towards Horton. Continue along this path for just over half a mile, before passing through a wooden gate in a stone wall. Continue for approximately 250 yards until reaching junction of paths (marked by another finger post and a small cairn). 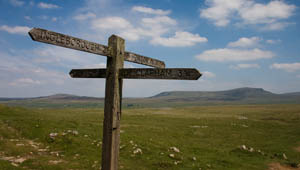 Turn right, following sign for Austwick. 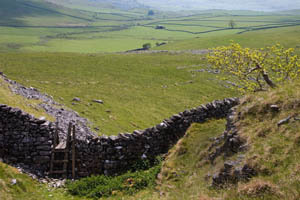 Where stone walls meet, pass through gate, then follow path alongside wall (again signposted for Austwick). By a National Nature Reserve sign on left, climb ladder stile on right (again signposted for Austwick). The path again weaves through an area of limestone pavement. There are some small cairns, but they mark a path between shooting butts - so if you are following them you may the path (pictured) which leads sharp right through a gap in the limestone scar. Follow the clear path down the valley. Go through a wide wooden gate to follow path enclosed by walls. Where the lane turns slightly left, ignore the ladder stile on right. Pass trhrough another wooden gate, after which the lane turns to right and you walk through another gate. At junction of tracks turn left and the path becomes narrower, but is still enclosed by walls. The track leads to the hamlet of Wharfe, where you continue along the track. Where the track meets the road, turn right and follow the road back to Austwick.